Great Horned Owl "Mrs. Harvey"
Great horned Owls "Rusty & Iris"
i have a question concerning pygmy owls. i wonder if anyone here knows the answer.. ? owls (like most birds) start their mating season in the very early spring, when it is almost winter in Northern countries. i think this concerns Baltic countries as well. 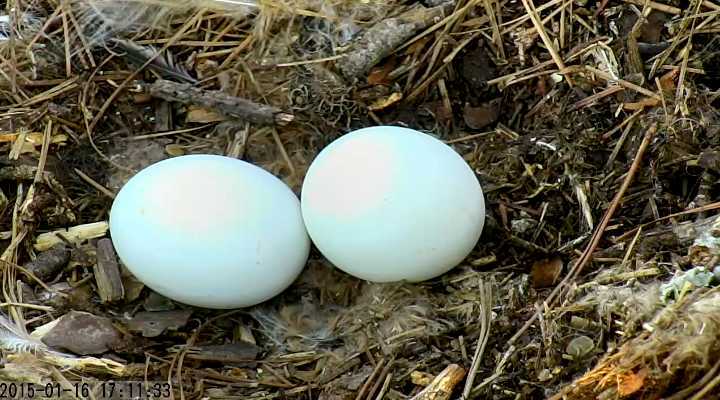 a pygmy owl has been heard at the Estonian WTE's nest camera in early spring 2010 and we also heard a pygmy owl whistling near the Latvian WTE nest last spring. now i have found in the Pontu archive videos at the Latvian nest pygmy owl's courtship whistling in the middle of the summer! 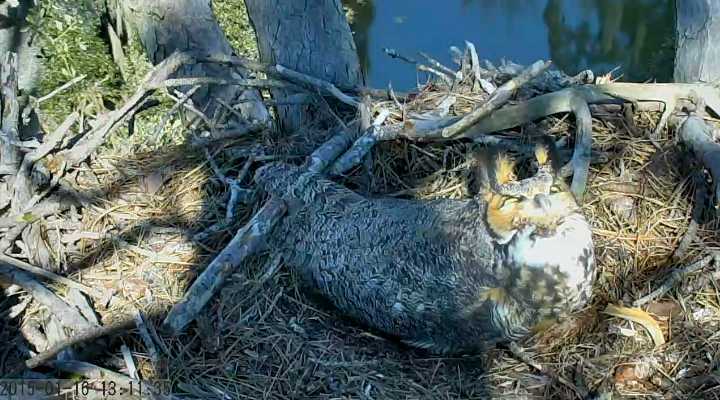 on June 21st a pygmy owl was whistling at 14:26 - 14:28 and at 15:40, in the middle of the afternoon. it continued whistling at 20:23 - 20:31 with some short breaks. the sun was still up at this time of the evening. 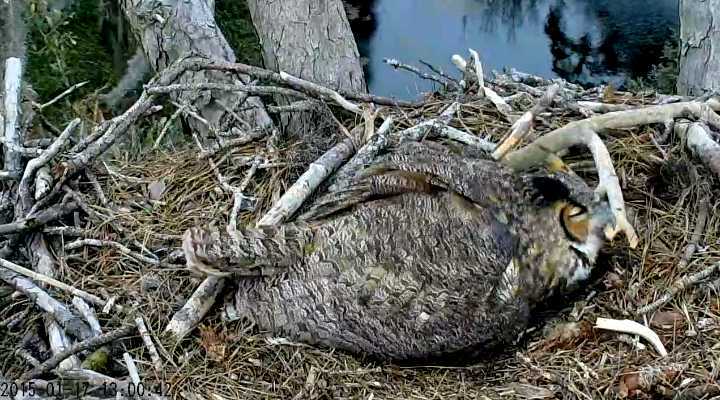 then in the next morning the pygmy owl whistled again at 3:36 - 3:41 with some breaks. this happened well before sunrise when it was almost completely dark still. my question is why was the pygmy still making its courtship whistling so late in the season? 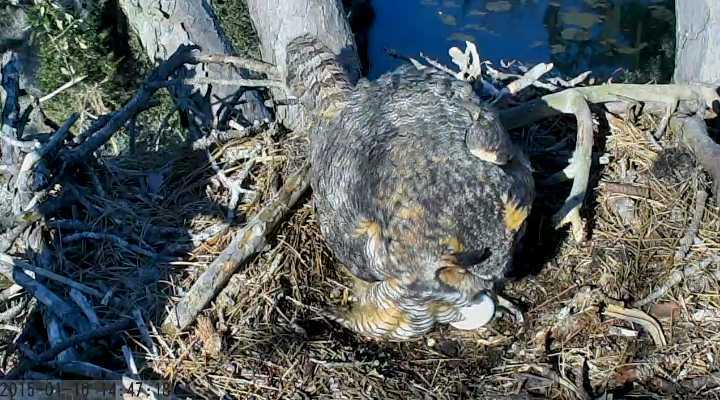 the nest camera was situated at Lake Lubans in Latvia. i have made clips with these voices. in the afternoon on June 21st the wind was rather strong at times but i think i heard the pygmy's voice. i have manipulated these early morning clips, increased their brightness and contrast. the sound is as it was. the intensity of the pygmy's voice varies. i think that it must have turned its head towards and away from the camera as it went on calling. Answer to your question is quite a simple. This call isn't courtship whistling. Stimulation of courtship mood is only one of function but there are some others, too - defending the territory, contacts between individuals from one pair, contacts between neighbours etc. During Frühlingbalz and Herbstbalz (this is in German. Forgot how these terms are in English) intensity of a calls grows up, but owls can do their calls in any time of the season. if i understood correct the Wikipedia article the word 'Balz' refers exactly to courtship. 'Frühlingsbalz' must be the courtship that takes place in the spring and leads to reproduction (bird chicks and puppies etc). some birds like black grouse males may have 'lek' displays (sing their courtship song and have the courtship tournaments). females aren't taking part in this autumn lek or aren't even interested in this. this must the 'Herbstbalz' ('syyssoidin' in Finnish). do pygmy owls have only one kind of call, the whistle? edit: i went to check Xeno-Canto for the pygmy's calls and it really seems that it doesn't have a very large 'vocabulary'. most of the samples are the whistle. lower in the list of samples there are three 'typical autumn calls' as they are described, and they are different, actually rather funny calls. those samples were recorded by Elias A. Rydberg in Norway. Yes, vocal repertoire of the Pygmy Owl isn't rich. Male has a whistle, which is also a song, autumn song (scale song), in excitement whistle gets irregular. Female has only a very thin drawn out call, similar to the Goldcrest. Herbstbalz is term in the life of the owls when in autumn vocal activity rises significantly. Also females take part in it but there are no mating. It's typical for mostly sedentary species like Tawny, Ural, Pygmy and Eagle Owl. 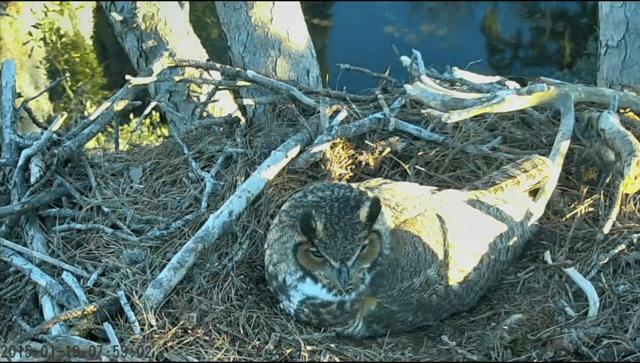 Mrs Owl incubates two eggs. 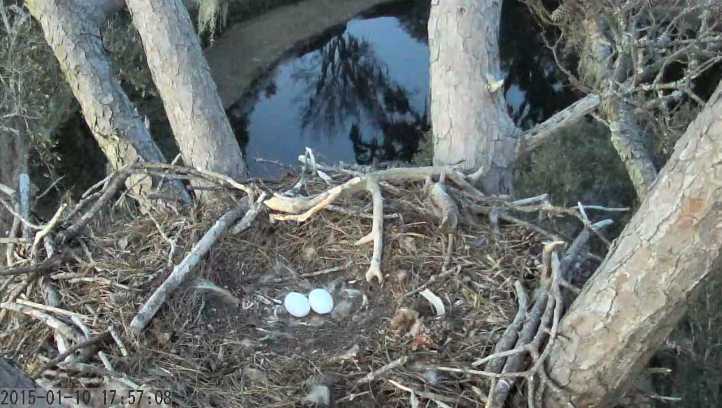 The nest looks like osprey's. Some animal (like a marten) tried to attack the owl. that looks like a vicious squirrel to me... aren't martens bigger than that? i looked up in Wikipedia which says that American marten's "Body length ranges from 1.5 to 2.2 feet (0.5–0.7 m)." 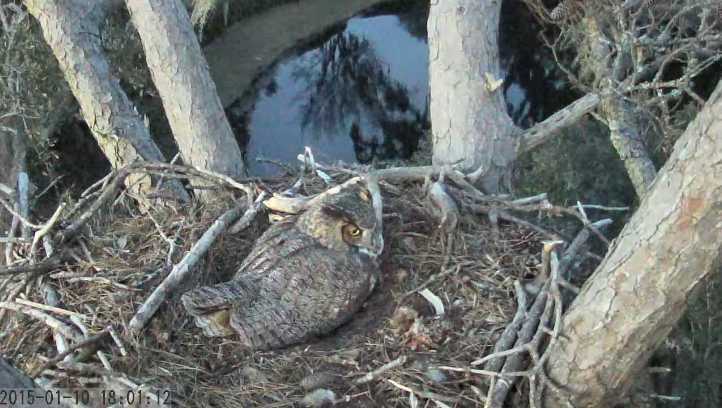 about great horned owls: "the great horned owl is quite variable in size across its range. ... Overall, adult great horned owls range in length from 43 to 64 cm (17 to 25 in) and possess a wingspan of 91 to 153 cm (3 ft 0 in to 5 ft 0 in). Females are invariably somewhat larger than males." 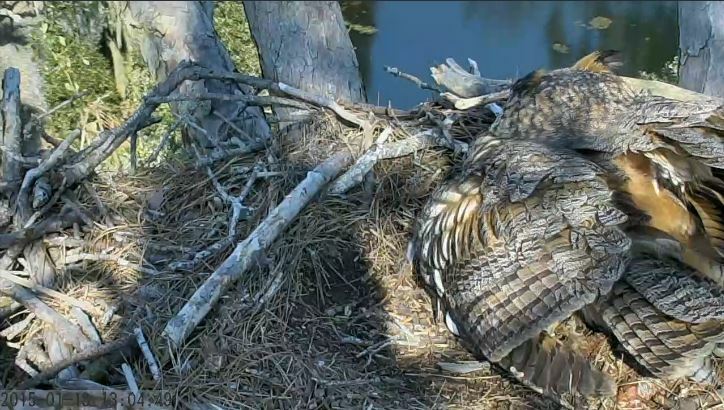 the length of the bird is measured from tip of beak to end of tail if i'm not mistaken, and that's what is more or less seen of the incubating parent. if the owl is about 50 cm long in the picture then the mammal should not be more than half of that...? is the tail included in the body length of the mammal or not? This animal was larger than you can see on my picture. It is because of the perspective, the owl is in the foreground. Animal had dark, long snout. I managed to do only one screen shot because it was moving fast. 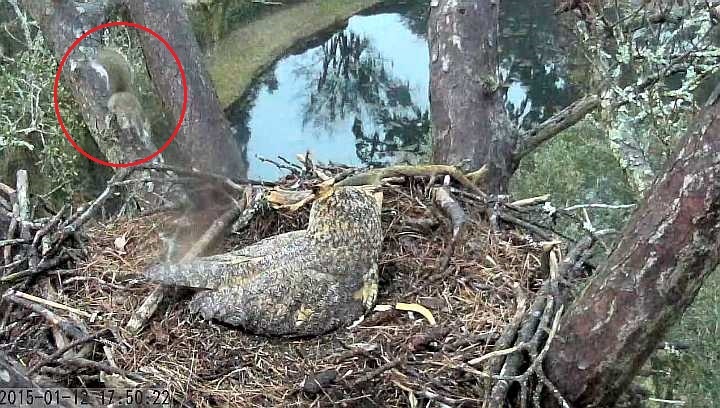 BTW I was watching this owl for four days and never noticed her eating. I have not seen or heard the male also. She leaves the nest for no longer than 5 minutes. 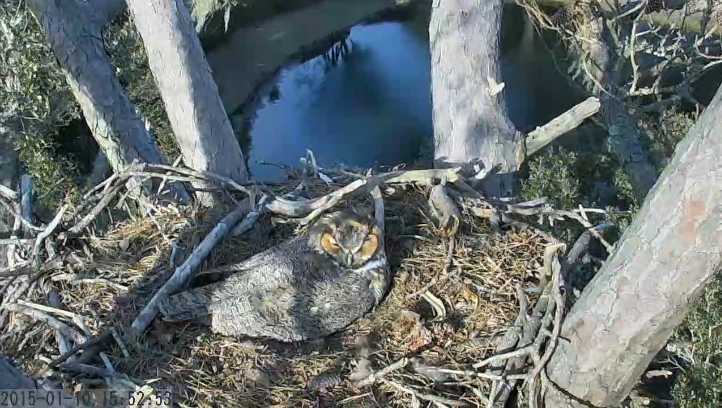 The owl is beautiful and I hope her breeding will be sucessful. 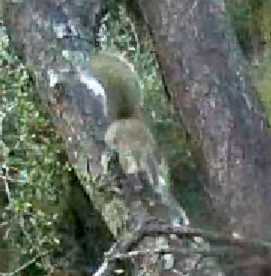 American marten doesn't occur in Georgia where this cam is located. I also think animal in this picture is a squirrel. 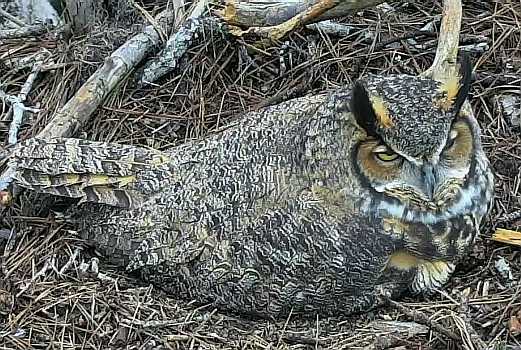 Owl incubates her eggs very quietly, sometimes she only moves her head to watch birds above or gets up to rolls eggs. GHO voice is very different than Eurasian Eagle-Owl. Voice is very important in separating of the different species of the owls. Sometimes much more important than plumage. Here is yet one good example of GHO hooting. Mrs Skidaway left the nest for a minute. I thinh that Mr Skidaway was somewhere near and passed her a prey.